Grand Villa Noi is a five-bedroom contemporary holiday home with a private, infinity pool and a splendid view of the Andaman Sea out front. The best part is the private beach access to the most popular Natai beach, for an unhindered experience. Travel with friends and family to this stunning retreat for a relaxing, tropical vacation with loved ones as you bask in the luxury and comforts offered by the villa. Five, lavish, spacious, and richly decorated bedrooms are available at Grand Villa Noi with floor-to-ceiling glass walls that provide an enviable view of the scenic vista. While you enjoy ocean views, relax on the Egyptian cotton sheets draped across your double-sized beds and enjoy a restful night’s sleep. The bedrooms are equipped with iPod and dock, LCD TV, and a fully-stocked mini-bar. If you seek some fresh air, head to your private balcony where you get that and much more. The bedrooms are air-conditioned and stocked with specially curated toiletries made from pure, essential oils. Gaping through towering palm trees and beyond the luscious green gardens lies the unspoiled beauty and white sand of Natai beach. Head to the ocean, submerge your feet in the sandy water, or simply lie back on your beach towels to soak up some sun. 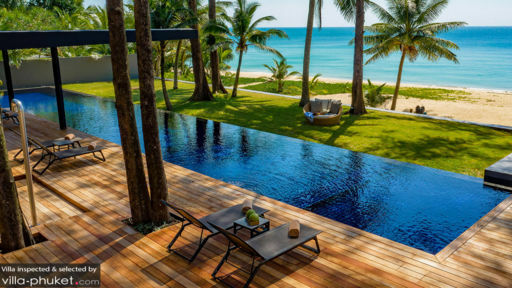 The villa itself offers an expansive infinity swimming pool flanked by a timber pool deck, facing the ocean, where you get to swim laps, play some games with your loved ones, or lounge on the sun chairs found under a traditional sala. 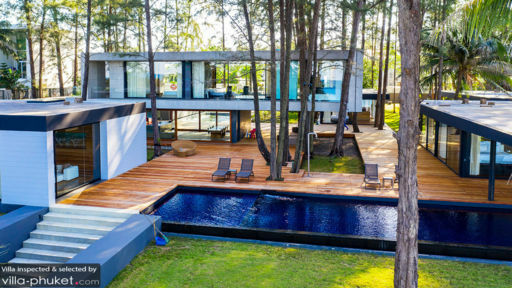 The villa has been designed by celebrated architect Khun Duangrit Bunnag, capturing the beauty and understated simplicity of Phuket’s many beaches and lifestyle. With a blend of modern with traditional Thai elements, he has successfully given you a place you can call home while you experience Thai living like never before. Rustic, wooden interiors, poolside living, endless views of the splendid ocean, and a cosy ambiance are only a few of the good things found at Grand Villa Noi. The Italian furniture comprises many contemporary pieces that are strategically found facing the pool. Numerous books, a writing desk, and utmost privacy come with the territory. For dining, the villa offers a one-of-a-kind experience where guests can choose from a candlelit dinner on the beach prepared by a private chef or a cocktail party with friends. A private BBQ is also part of the choice, to enjoy freshly-grilled veggies and seafood! The resort has several restaurants including The Natai, where you’ll experience fine dining in the truest of ways with a selective menu, skilled chefs, and excellent service. Grand Villa Noi offers quality services to guests to ensure that your stay is memorable and cherished. 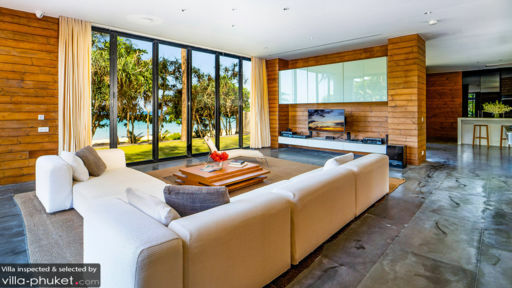 There is complimentary wireless internet throughout the property, an option for a private chef and direct beach access. If you wish, the staff can even arrange for in-house massages and take care of laundry in extra cost. Housekeeping, security, and management is catered for and you could even request for an on-call butler! The villa is indeed found in an excellent location with Natai beach right at its doorstep and several restaurants and bars in the vicinity. All you need to do is step outside, and you have many popular spots that you can check out. Phuket is known for its National Parks, Turtle hatcheries, and adventure sports. Indulge in a Waterfall Wine picnic or take a Private Natai Experience to truly immerse yourself in Thai living and culture!